Home / Latest News / Match Reports – Saturday 1st December. Home » Match Reports – Saturday 1st December. Match Reports – Saturday 1st December. North Ayrshire Wild (SNL) v Kilmarnock Thunder at Galleon leisure Centre, Kilmarnock. Wild travelled to Kilmarnock to face local rivals the Thunder. Wild led from the very beginning going 4-0 up in the 1st period. They didn’t stop there and netted another goal in the 2nd period. The 3rd period saw a spirited comeback from Thunder but it was too little too late and The Wild came out clear winners 7 – 2. It was all to play for on Saturday evening at the latest north Ayrshire Stars home game . Up against Kilmarnock the scene was set for a tough and entertaining evening of hockey . Both teams are at the top of the league table with not much splitting them but the Stars had the chance to top the table after tonight’s match. In the first period kilmarnock got off to a fantastic start, with two goals in the first 3mins of the game, remainder of the period was played at a frantic pace by both sides . Both teams are playing well and Kilmarnock dominate the Stars defence for much of the period. In period two the Stars start off much more positively than before and with Kilmarnock down to 4 players, it’s not long until the Stars scored thanks to Flynn Massie, bringing the score in at 2-1. After 5 and half minutes a Stars goal from Dylan Murray bringing the score back to 2-2. Kilmarnock are looking pretty tired at the moment to be fair and a tad caught off guard by the onslaught of goals . Kilmarnock score once more in the 2nd and it finishes at 3-2 but this is by far the closest game the Stars have had so far his season and both teams look fired up for the competition . After some tremendous play from the stars in the 2nd period ,the 3rd brings another goal against them early on . It’s now 4-2 to Kilmarnock. The game takes another turn when the clock is stopped and reset because the time had run on from the second,confusing for the audience perhaps, but this certainly added more anticipation and unknown to a very close match. Thanks to a goal from Liam Houston in the 1st 2 minutes of 3rd period, Stars were very much back on the game. Kilmarnock lead 4-3 until almost the very last minute, when Dylan bags his 2nd goal for the Stars, scoring, what was probably, the best goal of the night to bring the score back to 4-4 with about 30s remaining . The score concluded as that and this brought the curtain down on an exciting evening of hockey, both teams looking drained, but equally happy to take away a draw from this evening.Goals from: Flynn Massie, Liam Houston & 2 from Dylan Murray with Assists from Travis Baillie, Kerr Drummond, Josh Carslaw, Flynn Massie & Dylan Murray. Final Score: Stars 4 – 4 Tornadoes. Man of the Match: Kerr Drummond. 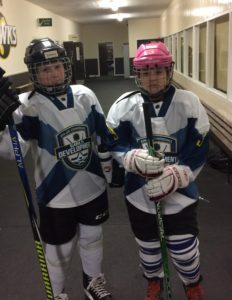 The Predators welcomed their old rivals Kilmarnock Blizzard to Auchenharvie ice rink for what would turn out to be a fantastic ice hockey game between two evenly balanced teams. The opening stage of the 1st period was an evenly contested game up until Haydn Woods opened the scoring for the home team in the first period just after the five minute mark with an assist from Antony Curlett. The Predators grew in confidence after the opening goal and two more in the space of two minutes from Harvey Hughes and Antony Curlett gave the Predators a deserved 3 goal lead at this stage of the match. If the Predators thought the game was over they were mistaken as Kilmarnock came storming back with three unanswered goals from Jamie Sturrock x2 and Connor McNulty to level the game at three each half way through the second period. Both teams traded goals with Haydn Woods getting his second of the game for the Predators and Charlie Christie replying for Kilmarnock to tie the game at four goals each. With time running out in the second period Aedan Orr scored with eight-seconds remaining to give the Predators a slender lead going into the third and final period. Again Kilmarnock came back at North Ayr with two quick goals in the opening three minutes of the third period with goals from Innes Gallagher assisted by Charlie Christie and Fraser Craig then Charlie turning from provider to goal scorer to give Kilmarnock a 6-5 lead. This time it was the Predators turn to show great character to come from behind and level the tie on the 37th minute mark with Antony Curlett getting his second goal of the game assisted by Haydn Woods and Connor Park. The closing stages were played at a fantastic pace with both teams going close. The Predators thought they had nicked it at the end when Aedan Orr got his second goal of the game with three minutes remaining but a fine shot from Charlie Christie for his second of the game with just over a minute left. Final Score: Predators 7 – 7 Blizzard. Man Of the Match: Ryan Drummond. We also had 2 of our girls who are part of the Scottish Girl’s Development Team, compete in their 1st game. This was at Hamilton Ice Rink against a development team of boys from Lanarkshire Lightning. Although they lost 9 – 6 the girls show some great team spirit & play after only 3 training sessions together. Well done to both our girls who took part, Emma Lamberton & Emma Miller and a big congratulations to Emma Lamberton who scored 5 goals and assisted on the 6th.